Every now and then, someone will ask me about "Anguilla all inclusive" vacation packages. It is almost an oxymoron. There are simply no cheap charters, cookie-cutter hotel chains, and buffet lines here. Many people long for a vacation such as this. So I did some searches for the term, "Anguilla all inclusive" at Google and Yahoo!. You'll find lots of sites, but they all try to lead you into an all-inclusive trip somewhere else. No doubt about it. You'll have a hard time finding an Anguilla all inclusive vacation package. And we shouldn't take that the wrong way. Anguilla is a small island. 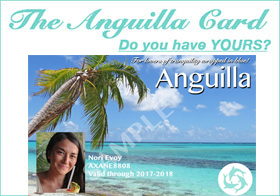 If it started to advertise "Anguilla all inclusive just $495 for 6 nights/7 days"... well, it wouldn't be the Anguilla that we know and love for very long. It's hard to get to Anguilla... and that's the way we love it. Once there, spending time is a privilege. Experience it to the max. Of course, do try to reduce the price of your airline tickets as much as possible. Check out Priceline or other tips on my "Getting There" page. Or, use our Cheapest Flights-to-Anguilla Finder, which finds your fastest and cheapest flights to Anguilla! Our best prices came from our local travel agent who has a trick I don't quite understand that involves "consolidators." 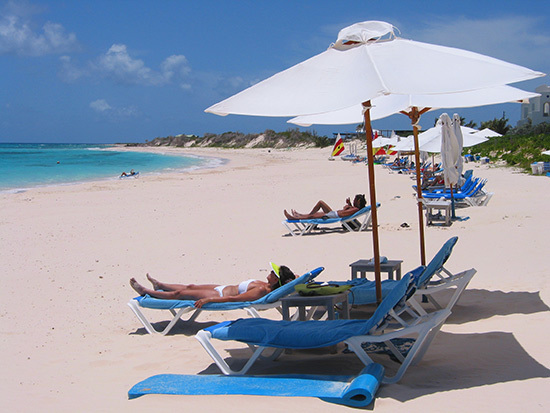 From there, the best bargains on the island are Anguilla villa rentals. I've talked about Anguilla villa rentals elsewhere -- our favorite Anguilla realtor, Jackie Pascher, can find you the best bargain on the island... no matter what your price range. Endless hours on these flawless beaches are free. • a Malliouhana sunset is not free, but it's pretty darn reasonable! Actually, there is whole lot to do and see, either free or inexpensively. And the last thing you would want to do on Anguilla is be trapped in an "Anguilla all inclusive" buffet line. Nor is there any need for it. You can dine very cheaply at Anguilla, all over the island. return to your ideal Anguilla villa, kick your feet up, slow all the way down to "island time" and say: "wow, what a day!" And there you have it... an extra-special all inclusive, Anguilla-style!